Merry Christmas to me! Over my holiday vacation, I decided to make myself a new bag. The parameters: it needed to be large enough for all of the stuff I schlep around on a day-to-day basis, have a fairly simple shape, be sturdy, and open to custom details and/or changes. 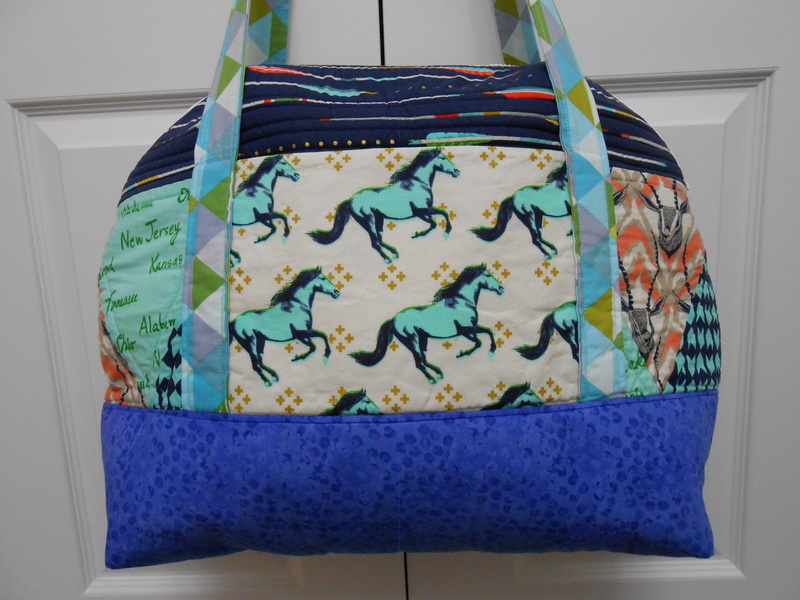 On Cyber Monday – Sew Sweetness was having a great 40 percent off sale. I ordered two patterns – the Aeroplane Bag and the Tudor Bag. Up front, I am going to say this – the Aeroplane Bag is *not* for beginners. If you are going to try this – I would recommend you tackle several “easier” bags first. 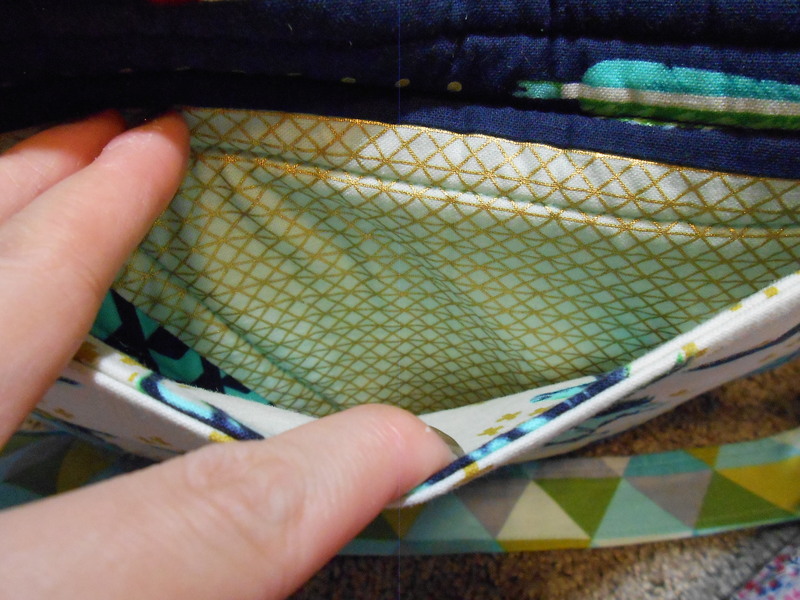 At this point in the game, you should be very comfortable working with interfacing, inserting zippers (including zippered pockets), top stitching through multiple layers of fabric, using a walking foot, and gusset construction. This bag is very time consuming, and you don’t want to waste all of those man hours for a mediocre finished product. From start to finish, this project took me about four days working about 6 hours each session – approximately 24 hours total (whoa!). 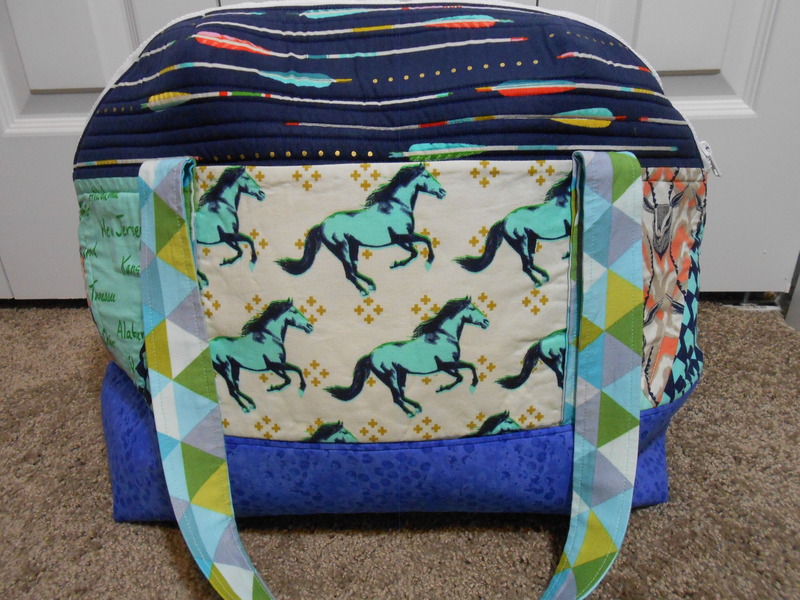 Keep in mind, I could have shaved off about 4-5 hours had I not done triangle patch work, added slip pockets to the lining, as well as another pocket between the handles on the front of the bag (using the adorable mustang print). 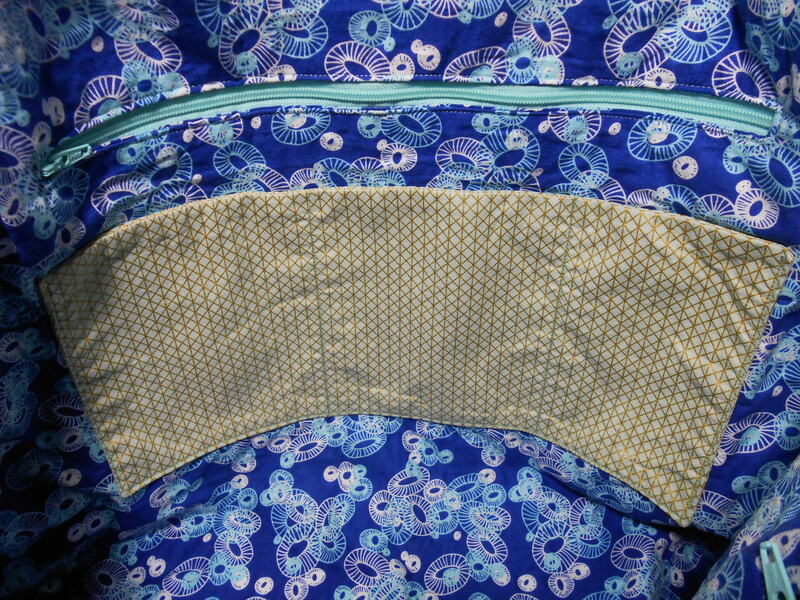 The pattern includes two interior zippered pockets, but I really like extra open pockets for items like keys or my cell phone for easy access. 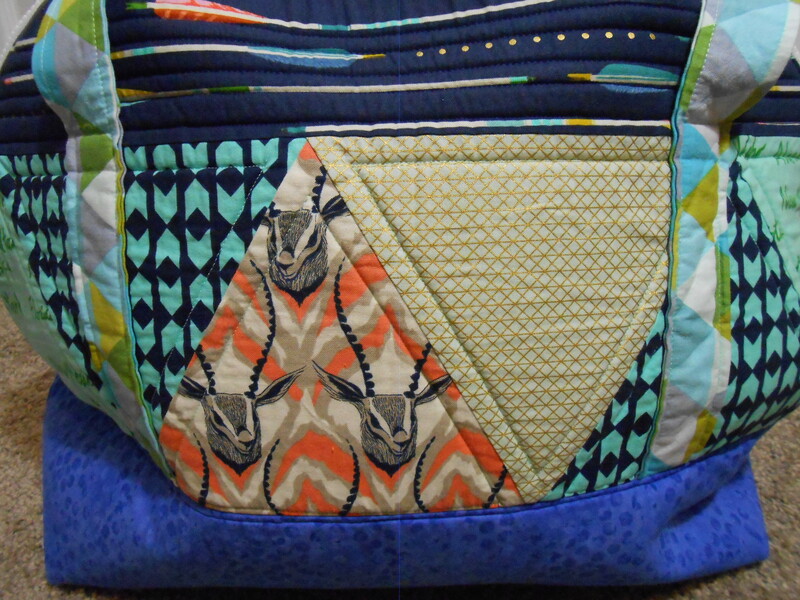 Helpful Hint: if you do patchwork quilting for this bag, prepare quilted pieces of Soft and Stable – then cut out the pattern pieces. If you cut out the pattern pieces/Soft and Stable before quilting – your pieces won’t be accurate. I spent a lot of time tracing pattern pieces, cutting fabric, pressing, and prepping for sewing. Now that I’ve made one, I do think the next ones would go significantly faster. I did have a major setback with my sewing machine’s walking foot – it died while I was quilting the exterior patchwork to the Soft and Stable. I ended up having to use my vintage Singer 201 2 for much of the project, because although the pattern says using a walking foot is “optional” I think it should be more of a requirement. (Note: vintage sewing machines are workhorses, but they can be very finicky) While the pattern called for a 24-inch sport zipper, I only had a 22-inch zipper. I modified the zipper to be 24 inches by adding fabric tabs to both ends. This worked out quite well, as I didn’t have to stitch over the thick teeth and risk breaking a needle. For whatever reason, my zipper seems a little wonky at the very top. This bag is HUGE! There are two options – regular and long. I made the regular size and no kidding – it is about the same dimensions as a bowling bag. This bag will fit everything I need for my work day – a water/soda bottle, lunch bag, wallet, hand cream, etc. with NO problem. The photo on the pattern doesn’t do the size justice – the bag was larger than what I expected. For a future version, I may try and emulate a smaller pattern piece for a more petite Aeroplane Bag. The pattern called for using three types of interfacing: Annie’s Soft and Stable for the exterior upper portion, a lightweight woven fusible interfacing (Pellon SF101) for the lining, and Peltex 70 Ultra Firm sew-in for the exterior bottom portion. Personally, I think I’ll try a firmer interfacing for the lining of any future Aeroplane Bag attempts. Even with the Soft and Stable and Peltex for the bag exterior, my bag just didn’t seem to hold its shape very well after I laundered it. Recently, I bought an entire bolt of extra-firm craft fusible interfacing that might work. I’ve noticed that many bag designers are recommending Annie’s Soft and Stable in their patterns and I have now tried this interfacing in two bags. Here’s my take on it. 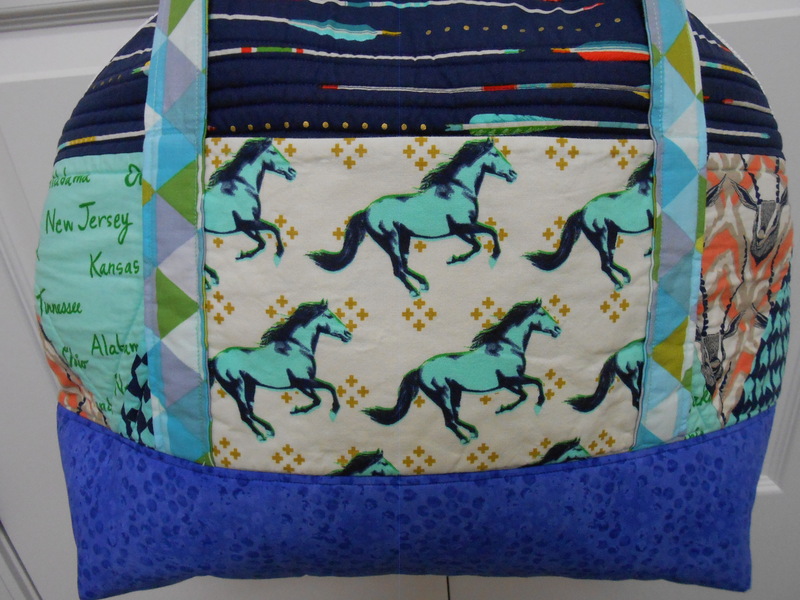 While it is easy to sew/quilt with – I wish there was a slightly more stable or firm version available. It’s also expensive to purchase – a 72″ by 58″ piece is about $37. Sure that will make several bags – but it adds significant cost to a project. For me, there were a few frustrating parts of this pattern. Sewing the exterior and lining pieces to the zipper, and then top stitching them so they don’t “catch” the zipper was definitely the most challenging step due to the shape of the bag. I recommend using a denim/upholstery needle for constructing the bag. Full disclosure: I am often disappointed with the way my top stitching looks. Neither of my sewing machines are great for straight stitching. Eventually I plan to upgrade to a nicer “dream machine” but for now – I’ve got to make do with our Brother SE400 and the Singer 201 2. Overall, I am satisfied with purchasing this pattern for the Aeroplane Bag. It was a good learning experience, and I doubt I could have made a bag like this on my own so it was money well spent – especially with the discount! It’s easy to make slight modifications for a more “custom” version. 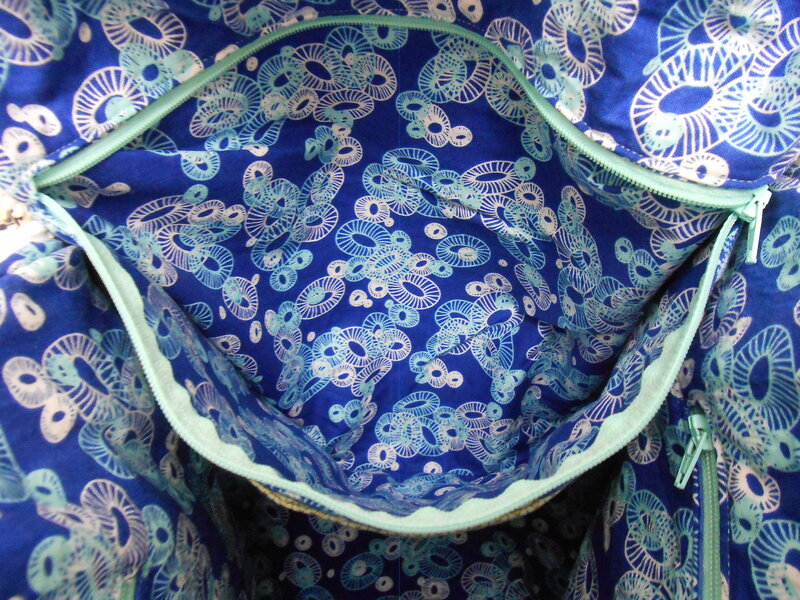 Several of the techniques used in its construction could be easily applied to designing your own bag – darts, adding a zipper to a curved profile, gussets, exterior comprising of an upper and lower portion. This was my first time trying a Sew Sweetness pattern. I enjoy reading Sara Lawson’s blog, and posted several in-progress photos to Instagram and she obviously enjoys seeing others making her designs as she liked and commented on my feed. 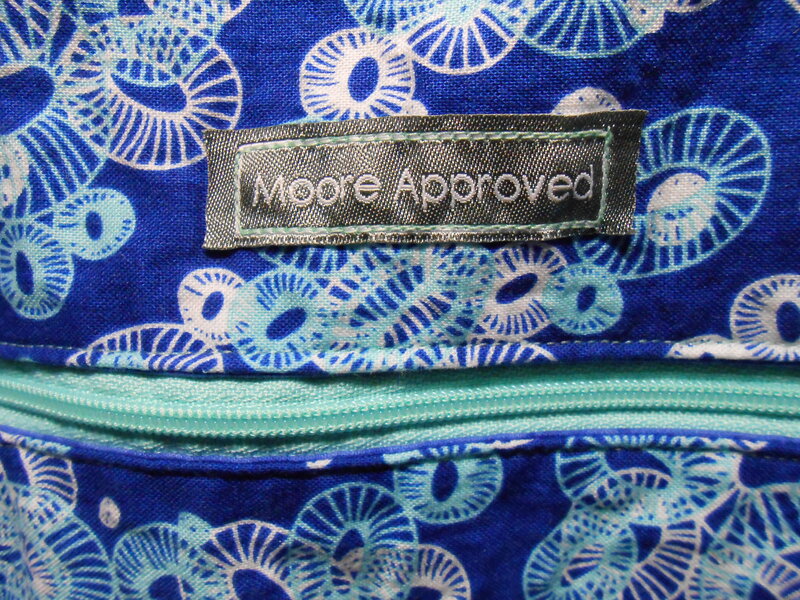 In fact – she was Moore Approved’s very first Instagram follower! I see her patterns not only just for a pattern, but as a teaching tool for bag making. 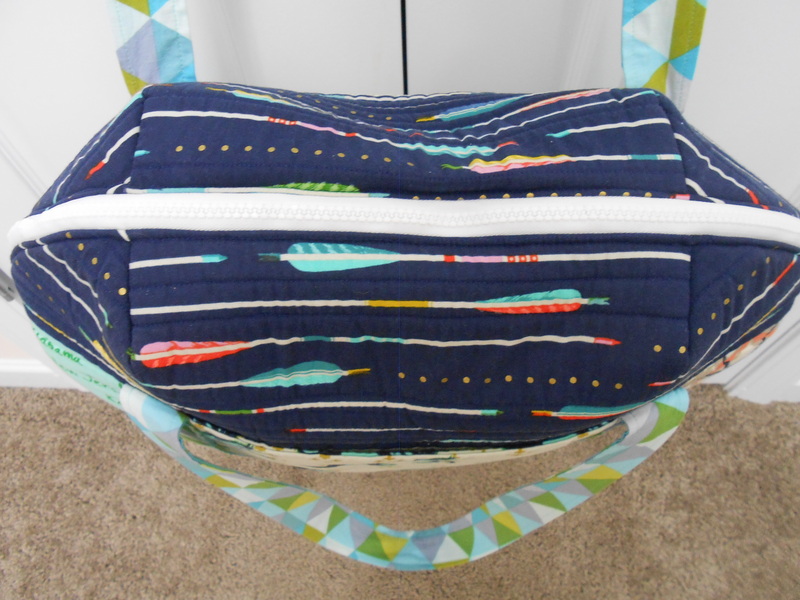 One Response to "Pattern Review: Aeroplane Bag by Sew Sweetness"
I’m in the midst of making my second aeroplane bag, and I feel like the top zipper insertion was poorly explained. I wasn’t that happy with my first zipper, and wondered if putting tabs on a shorter one would make it better. Seeing that you’ve done it, I think I’ll try it! Thanks!